As of 2:30 yesterday I became officially single. It took the help of my school and a trip to 3 different ministry offices. My school sent a representative to accompany me on my travers through north Quito. At 8:30 we reached office #1 where they asserted that it was not the correct office and they could not help (even though the schools lawyer and various notary offices said it was where we needed to go). They wouldn't let us talk to someone and sent us to office #2. Office #2 let us meet with someone who pulled up my records, however they were my immigration and visa records. The first showed me as single and the second doesn't collect marital status. And my marital status was wrong in the notary system. So off to office #3. Again this office wouldn't move us on to speak with someone because, this time, I was not Ecuadorian and I did not have an Ecuadorian ID. So they sent us back to office #1. At office #1 we again pled our case to the appointment gatekeepers and they didn't want to let us through, but they guessed we could try talking to someone on the 10th floor. The 10th floor gatekeeper decided we could go and speak to someone through the doors, to the right, down the hall, passed the elevators, and make another right. We walked into a room full of desk pods. We stopped at the first and begin our story yet again. The ladies in front of us were disinterested, but the man behind us (I will call him helpful man) was curious and in touch with the absurdity of the whole situation and wanted to help us. He begins searching his databases and then calls a friend. While he is on this call, there is an announcement that should there be an emergency we should stay calm and follow the instructions of people there. I though hmmm, that's interesting, I guess office buildings are now doing the same thing Movie theaters do before a movie. The man in the office is passing my information on to his friend on the phone and then... MAH MAH MAH MAH the alarm goes of and we have to evacuate. From the 10th floor. Interesting fact, they evacuate the entire 10th floor then the 7th, the 5th the 3rd and so on. It was fascinating. We proceeded to wait outside in the sun with 3 or 4 other buildings who were also participating in the drill for an hour and 15 minutes. It was a drill complete with ambulances, police vans, all branches of the Ecuadorian police force, and a helicopter. Once we returned to the 10th floor, the helpful man had a print out of my information from the notary system that showed me as married. He pointed out that that information and my gender were greyed out and he did not have access to change it. He was however going to find out who we needed to talk to and where we needed to go. He called another friend (I think, I'm unclear if it was the same man) and began our story. He made sure to add that this was a big deal as I was buying a car and as my martial status was wrong, I wouldn't be able to sell my car unless I produced a husband. Which did not exist. His friend on the phone was supposing that I needed to go back to the original notary to have this fixed. We interrupted to say, we had been to that notary and 2 other notaries. All said they couldn't help us and that this office was the one were were supposed to come to to fix this. The man on the phone then provided 2 phone numbers to the helpful man. The first one didn't pick up. The second did. She was a Director and in someway oversaw the notaries of Quito. She said she could help, she would have it fixed this day. She just needed an email with my passport, AND the name of the original notary because "this lady should not have been sent all over Quito to have this fixed". The helpful man then began to compose the email, he had it almost finished and then he asked for the notary's name. I gave it to him and he was surprised. It turns out he personally knew this notary. She was his friend. He then decided he wanted to call her before he sent this email because he didn't want to get her in trouble. He calls her, she agrees to help. He sends us off to her office, but he gives us his number and tells us to come back if she doesn't and he would then send the email. We then walk the 4 blocks to the notary's office. She is confused as to why she is the one that needs to help us, but assures us that she will. She repeatedly remarks how confusing this is and she will have to call the helpful man back and find out why we are with her. While continuing to reassure us that she will help us. She pulls up the notary document her office did and the document says I am single. She then has a side conversation where it is commented that they enter me into the system, but they cannot edit the system. They then call someone in some other office to have it fixed. The need to send a copy of my passport to prove my marital status. 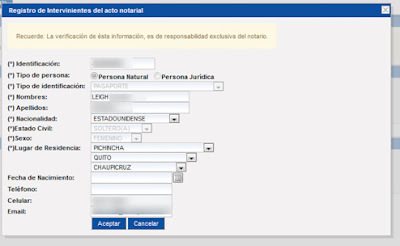 I have to explain that as a citizen of the United States and not Ecuador, we do not track this information on our identifications. By 1pm my information was sent to that office and then they promptly we to lunch. We were give the option of waiting or returning to confirm that it all had been fixed. I asked if we could call. They said yes, we should call after 2:30pm. At 3:00 pm I got an email with a screenshot attached showing my updated and correct marital status. How did this happen? Apparently last year in October I had my packing list notarized for the items I had shipped from Trinidad to Ecuador. 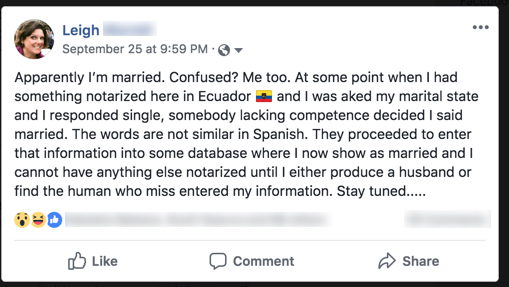 When I went to a notary on September of this year to have my car purchase notarized to legalize the purchase, I was informed that I was married.